Map of Part of the Island of Hawaii Sandwich Islands Shewing the Craters and Eruption of May and June 1840. This extraordinary production is Commodore Wilkes' 1841 U.S. Exploring Expedition map of the island of Hawaii. An incredibly important work, this is, according to Fitzpatrick, the 'first geometrically constructed map of any significant portion of Hawaii.' Wilkes' map covers the vicinity of the volcanoes Mauna Loa, Mauna Kea, and Kilauea as well as the Hawaiian shoreline roughly between Laupahoehoe and Kahaualea, including Hilo Bay and city. Topography is rendered by hachure. Wilkes' map presents an extremely detailed view of the region - the most impressive yet achieved. The basic outline of this map is based on observations taken personally by Wilkes on the summit of the lesser volcanic peak of Puuluhulu (identified here). These were supplemented with secondary observations, also taken by Wilkes, at Mauna Loa, Kilauea, Mauna Kea, and Hilo. The map is not however, without flaws, among which are his misplacement of Kilauea by some 8 miles and Hilo itself by 4 miles. These errors lead to a general distortion of the coastline and a slightly inaccurate presentation of the relative locations of the various volcanoes. Nonetheless, Wilkes's map of southeastern Hawaii was the best map of that region produced until the late 19th century and of monumental importance to the mapping of Hawaii. 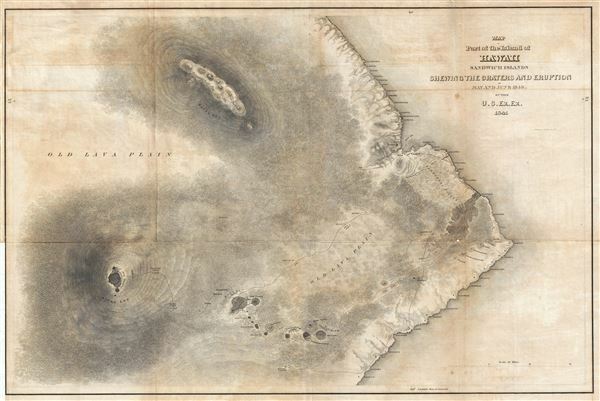 This region of Hawaii was the focus of Wilkes' most intense scientific scrutiny - hence this detailed map was produced to accompany the official expedition report. Imagining himself a later day Baron von Humboldt, Wilkes planned to achieve lasting scientific fame for climbing Mauna Loa, Hawaii's largest volcano, and conducting various scientific experiments at the summit and in the caldera. At great personal risk one of his men even managed to obtain a lava sample. The map identifies traces of Wilkes' scientific ardor, including such terms as 'Pendulum Peak' at the summit of Mauna Loa where the expedition set up a vast pendulum intended to measure the density of the Earth's crust, Recruiting Station, the expedition's second camp, and Sunday Station at the volcano's base. This map was prepared by Charles Wilkes and engraved by J. H. Young and Sherman & Smith. Despite being dated 1841, and copyrighted in 1844, it was first published by Lea & Blanchard of Philadelphia to illustrate the atlas volume of the 1845 first edition of Wilkes' official U. S. Ex. Ex. Report. Rumsey 4442.005. Fitzpatrick, G. L., The Early Mapping of Hawai'i, pp. 95-97, pl. 56. Philipps (Atlases) 3245-5. Forbes, D. W., Hawaiian National Bibliography 1780 - 1900: 1831-1850, p. 428.